"This is surreal. I kind of have to pinch myself, here," Heather Hopper says and actually pinches herself as she corrals with her fellow Wilderness Girls in the hotel's Crystal Garden ballroom. 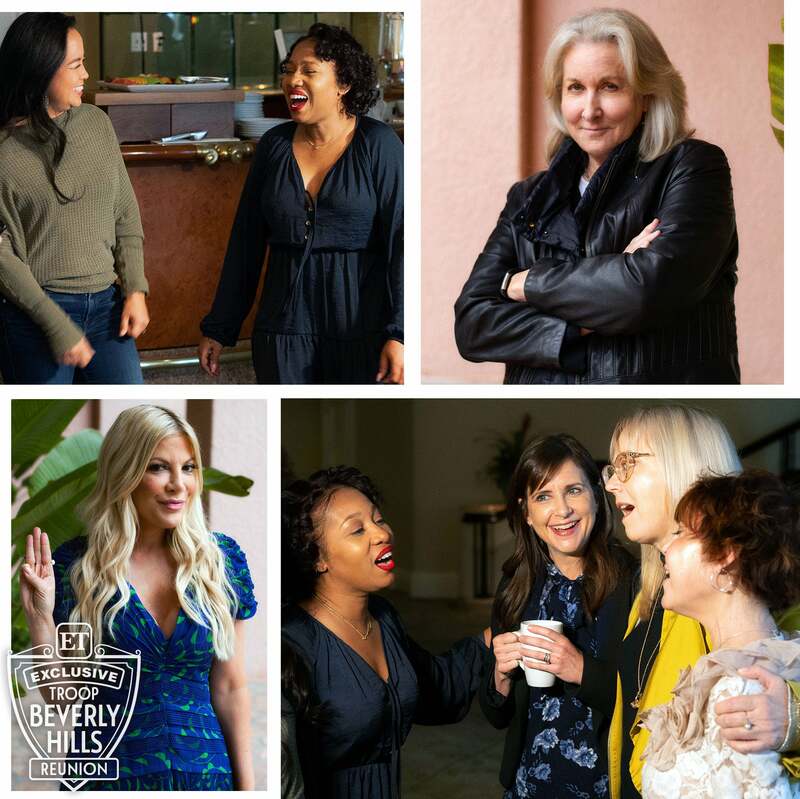 In addition to Hopper (who played the bespectacled Tessa DiBlasio), there's Aquilina Soriano (Lily Marcigan), Tasha Scott (Jasmine Shakar) and Kellie Martin (Emily Coleman), plus Dinah Lacey of the rival Culver City Red Feathers. "Don't hang out with them. They're still snots like before," Betty Thomas, who co-starred as the villainous Velda Plendor, deadpans as she joins the group. "None of you grew! What happened? Tori's the only one who grew!" Tori Spelling, one of Velda's ruthless Red Feathers, timidly hangs back, hoping to request a photo with Shelley Long. "I'm nervous to ask! I'm so not that person!" Troop Beverly Hills is the story of soon-to-be divorced Beverly Hills housewife Phyllis Nefler (Long), who becomes the unconventional den mother to the daughters of movie stars and boxers, romance novelists and plastic surgeons. Now, 30 years later, the cast excitedly recounts plot points from the movie and spontaneously breaks into song like they're reminiscing about their own summer camp. Which, in a sense, it was. The movie was hardly a hit when it premiered at the turn of the decade, but sleepover-having, mall-going teens took to it and in the years since, Troop Beverly Hills has become a cult classic, an overlooked gem about friendship and teamwork and a reminder that in the wilderness of life, you can never be too prepared. "Did you see that restaurant that did a musical?!" Thomas says with a laugh. "How about the fact that a guy played me?" "It's also been done in drag," Hopper chimes in of Peaches Christ and Trixie Mattel's parody show. "They did a whole 'Cookie Time' and I was getting into it, screaming in my seat!" ET brought together the one-time rival troops to share memories from the set and sing along to some campfire hits. Decades before The Real Housewives of Beverly Hills, there was Phyllis Nefler, the socialite-turned-troop leader played by Long, best known at the time for starring as Diane Chambers on "Cheers." Though it's impossible to imagine anyone else in the role now, Phyllis was almost going to be played by Bette Midler. SHELLEY LONG: [Bette] has red hair, and Ava Fries, whose story this is, she has red hair. So, I think maybe someone suggested that to her. It kind of makes sense, but she would have done it differently. KELLIE MARTIN: It's so amazing the way things work out. LONG: I actually was supposed to do something different for Jerry Weintraub and his company and at the last minute, I said, "I don't think I'm right for this. I just don't." But I said whatever your next thing is and this was the next thing...I do have the wig [still]. I almost brought the wig, because if she could talk, I'm sure, what stories she could tell. 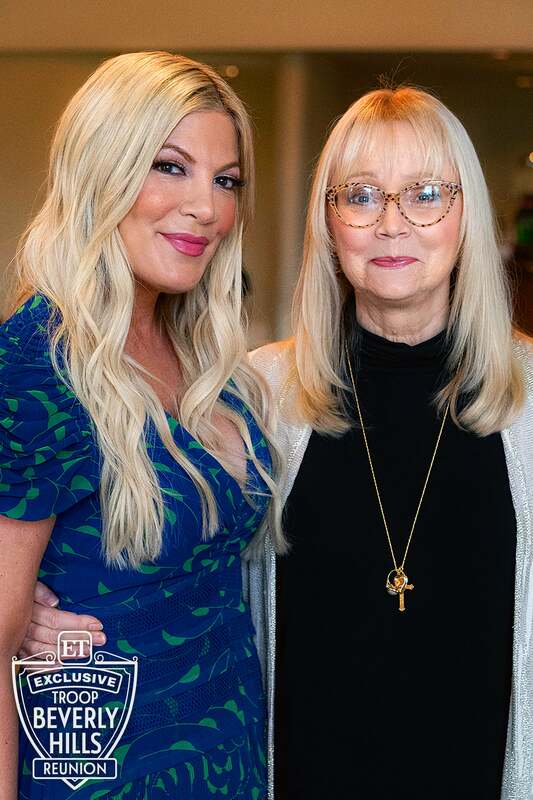 Jeff Kanew, who directed the film from a script by Pamela Norris and Margaret Oberman, cast Emmy winner Betty Thomas in her final acting gig -- and newcomer Tori Spelling in her first film role. BETTY THOMAS: [Shelley] made me do that movie and I had to wear a wig because my hair was red at the time. So, I had a blonde wig on and you had the red wig on. It made no sense. LONG: I didn't even know she had a wig on! No, this is what I did to Betty on the set. [Bowing] "Thank you, Betty. Thank you, Betty. Thank you, thank you." HEATHER HOPPER: Betty was so much fun to be with on set. I remember in Mammoth, she would entertain us and you would tell the funniest jokes. Some of them were lewd, but we loved them! THOMAS: I don't think I could act if you paid me. Wait a minute...! TORI SPELLING: It was [my first]. Well, first one not from my dad. My dad had put me in little things. I was 14 when we did this. Obviously, I had a small part, but I just loved watching. On set, [Betty] was definitely my mentor and I was taking everything in the comedy. I mean, we did everything. LONG: You could not have studied [and] observed anyone better. I'm sorry, it's just becoming a lovefest, Betty. I never get to say any of this! SPELLING: I had a great time. But it was the flip for me. I was coming from Beverly Hills, I grew up in Beverly Hills, then I was playing the opposite. We were from Culver City, which is supes chic now, by the way. "Troop Beverly Hills" was shot on location in Beverly Hills -- including such iconic landmarks as Rodeo Drive and Wolfgang Puck's Spago restaurant -- as well as nearby Malibu Canyon, where the cast of teens was "overheating" during the sweltering summer shoot. DINAH LACEY: It was so hot and the polyester Girl Scout uniforms and then the red feathers and we had to have that war paint on, it was just constant sweating. It was really hot! SPELLING: I had never hiked before, and I tried so hard to fit in. HOPPER: I guess it was puberty -- I don't know what was going on -- but it was hot and I was sweating, like, a lot, so it's sort of embarrassing but the wardrobe had to keep, like, four or five extra shirts just for me, because I had to keep changing my shirt. The movie is full of hijinks, but perhaps the most memorable is "Cookie Time," as a Tina Turner-wig-wearing Jasmine and the rest of the troop perform a catchy number to shill Wilderness Girls cookies outside of the luxurious Giorgio boutique. LONG: I think "Cookie Time" was pretty fabulous, when we were out on Rodeo Drive and singing. And that's a really good song. [To Tasha Scott] Right, honey? Just give us a couple of bars. AQUILINA SORIANO: And she wasn't lip syncing! TASHA SCOTT: Everybody. Everybody. I get that and I get, "Excuse me, officer. Don't you know who this man is?" [Laughs] It feels good, it does. MARTIN: It was so amazing to watch [Shelley] work. I remember, because we were all 11, 12 years old, to watch her work every single day, we learned so much. It was an amazing acting class for us and just learning how to be professional. It really was. I never got to do comedy much and so to watch Shelley was pretty remarkable. LONG: That was a really fun scene, too. "He permed me!" HOPPER: We were all so excited because we were all in the tent and I just love that scene, because we're just cheering you on and we want you to make it so badly. Then we have our "Kumbaya" [moment]. I just loved that. MARTIN: Was the "Kumbaya" thing an improv? I feel like that came up in the scene? LONG: It was an improv during the table read. You know, if you're lucky, you get to read the script around the table before you start shooting so you have a sense of the continuity. And I just broke into "Kumbaya." And the Ghostbusters 2 guys wanted to use "Kumbaya," but we already had it! The film debuted to not-so-fabulous reviews -- Roger Ebert dubbed it "a sitting duck for satire" -- but with its unforgettable fashions and instantly quotable one-liners, it went on to become a classic beloved by a certain generation of Blockbuster-going Millennials. LONG: We knew it was special as we were doing it. We were having a lot of fun so that was good, but you never know how that's going to translate. MARTIN: I think it's amazing that it holds up. I actually just watched the movie for the first time in a long time and I couldn't believe how funny it was, because I didn't get the jokes when I was 12 years old. It was like watching it for the first time because I really got all the jokes and appreciated all these amazing performances. It was totally over my head. I was just hanging with the girls at that time, really, and saying my lines. That's all I was doing. SPELLING: And the costumes. I feel like you watch them now and you're like, "Oh my gosh, iconic." Like, legendary today. Shelley's costumes were, like, amazing. MARTIN: A lot of men, actually, love this movie. I'm always surprised on Twitter. MARTIN: No! They're never straight men. They're always sending me pictures of themselves wearing some kind of Wilderness Girls type of outfit and that is maybe my favorite tweet to receive. I love that so much. LONG: I did have at least one straight guy -- and I was probably talking to some of the women around him -- and he said, "Yeah, I watched it with my sister," and then he said, "It was pretty good." SCOTT: [When they watched it], my kids said, "Oh, mom! You're famous!" MARTIN: My 12-year-old looks exactly like me, so I think it made her very uncomfortable to watch the movie. She sounds like me, everything, so she definitely downplayed her excitement, because I think it made her very weirded out. But my 3-year-old absolutely loved it and thought it was hilarious and I don't understand that at all. Like, she seemed to get the jokes and absolutely loved it! SPELLING: My kids did not recognize me in it, because I dyed my hair brown. But they loved the movie and my daughters especially loved the costumes. And they're like, "Girl Scouts! Like, we buy Girl Scout cookies!" And I'm like, "No, this is actually a thing." They're such L.A. kids. Like, "You could actually be a Girl Scout and do this" -- except camping out at the Beverly Hills Hotel. One of the film's most famous fans is Kim Kardashian West, who had a "Troop Beverly Hills"-themed baby shower complete with indoor teepees and Girl Scout cookies. LONG: Actually, there was some talk about me for her birthday, I guess it was. But somehow the communication on that got messed up. THOMAS: That would have been cool. LONG: I would have liked to have been there for her. In this age of peak nostalgia, in which '80s classics like "Bill & Ted's Excellent Adventure" and "Heathers" have gotten the remake and reboot treatment, "Troop Beverly Hills" is a property that feels destined to be revisited -- perhaps with a sequel. THOMAS: I think we should do it. I actually know that Sony has a script over there. LONG: They've had it for a long time. THOMAS: And it's not quite good enough yet, but I'm going to direct it. I'm making this stuff up-- [Laughs] Now I have to direct! SCOTT: Will we play our young selves or will we play our old selves? LONG: No, they're talking about a new cast. We could have some cameos! THOMAS: I would [direct]. I should, definitely. I actually know that there's a person going in to pitch it with the idea that I would direct it and that she is going to do the rewrite on it. I'm not supposed to say any of this! Watch the 'Troop Beverly Hills' Cast Get Surprised With Video Messages From More Co-Stars!